Fran Jurga`s Hoof Blog: News from Hoofcare + Lameness: Viagra: Might It Be the Next Big Hope for Laminitis Therapy? Viagra: Might It Be the Next Big Hope for Laminitis Therapy? Today, March 27, is the tenth anniversary of Pfizer’s launch of the drug known asViagra. Disclaimer: This post is published as "food for thought" only. Please contact your veterinarian about the possible benefits of vasodilation therapy for individual cases of laminitis and remember that the mention of Viagra in this article is based on a veterinarian's anecdotal experience with its use in a combined medication/therapy program and that Viagra's use is countered by other laminitis experts quoted at the end of the article. 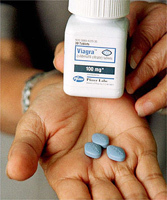 Viagra’s primary use was discovered by accident, during clinical trials. The drug’s active ingredient is sildenafil citrate, a cardiovascular drug that was being tested for its ability to lower blood pressure. Test subjects started asking for more. Since then, sildenafil citrate has helped rare Panda bears regain interest in breeding at zoos. The newest hope for the little blue pill is that it may be a potent treatment for jet lag. Hamsters given sildenafil citrate recovered from jet lag 50 percent faster than those without it. Studies at Tufts University's Cummings School of Veterinary Medicine and published by the American College of Veterinary Internal Medicine (ACVIM) found sildenafil citrate helpful for dogs with pulmonary hypertension. Veterinary researchers in Turkey found it helpful in canine wound healing. A quick search of the web suggests that sildenafil citrate is being tested for EIPH (“bleeder syndrome”) in racehorses and for breeding problems in some stallions in Europe. Horse and Hound reported that a German judge ordered Viagra therapy for a stallion during a post-sale dispute, and in Italy, racehorses have tested positive for the drug. But what about laminitis? Vasodilation therapy is encouraged by some veterinarians, and dismissed by others. And not all vasodilators work in the same way. His treatment regimen for laminitis includes most traditional medications used by other equine-specialist veterinarians, plus the Platinum Performance supplement Hemoflow, in hopes of nitric oxide enhancement. His Viagra therapy is roughly ten days on followed by ten days off, so he can monitor the pulse in the foot. “If the pulse comes back, I put them back on it,” he said. In a telephone interview with Hoofcare and Lameness Journal, Giccopuzzi said that he thought about laminitis as a potential application for Viagra as soon as he read about the drug’s chemical composition. “I started using it on the next founder case,” he said. “And I’ve been using it ever since.” He noted how difficult it was to stimulate blood flow to the damaged capillary beds in the horse’s foot. He also recommends it for specific cases of sore heels, along with corrective shoeing, when indicated by scintigraphy. “I can see the change in the nuclear scan after 30 days,” he said. Not everyone agrees it’s worth a try. In May 2007, the Blood-Horse.com conducted an interactive web interview with Dr. Dean Richardson, head of surgery at the George D. Widener Hospital for Large Animals at the University of Pennsylvania’s New Bolton Center. He is widely remembered as the veterinarian who cared for the 2005 Kentucky Derby winner, Barbaro, whose death was linked to complications of severe laminitis following surgery for a complex hind leg fracture. During that interview, an anonymous Texas veterinarian queried the famous surgeon about the viability of Viagra in laminitis therapy, saying that he was having excellent results combining mechanical de-rotation (of the foot) with Viagra (as medical therapy). Richardson responded: “Viagra is a specific type of phosphodiesterase inhibitor. This means that it regulates blood flow in a very specific manner. The problem with phosphodiesterase inhibitors is that they are highly variable in terms of which tissues they affect and there is also considerable variation among species. When asked about the potential use of Viagra for laminitis, researcher David Hood DVM PhD of the Hoof Project in Bryan, Texas was quiet for a minute, then responded, “Well, yes, but we don’t really know. It has never been studied. There are no tests. Thanks to Dr. Giacopuzzi for sharing his success stories and enthusiasm and imagination. All HoofBlog text and images © Hoofcare Publishing unless otherwise noted. Regarding your Hoofblog article of 3-27 about Viagra for Laminitis therapy, you should be aware that many of us "barefoot" people are helping our horses recover from Laminitis and Founder with the Chinese herb Jiaogulan or (botanical) Gynostemma. It seems to have a similar or better effect as Viagra for these conditions but at a substantially lower cost. Pennies per dose actually! Her contact information is there if you'd care to speak with her. She has been working with people on the Equine Cushings list as well as contributing to other hoof care groups. Thanks Fran for your Hoof Blog. I never miss it! How and what dosage used of Viagra? Hi Cheryl, and thanks for your visit. The Chinese herb Jiaogulan first came to my attention as the "magic" ingredient in the supplement LaminaSaver, developed by Rosanna Figuerola of Figuerola Labs. As I recall, Dr Kellon picked up on Jiaogulan for further study and began suggesting supplementation. I've asked Dr Kellon several times for information to publish on it. Unfortunately, unless things have changed recently, when a veterinarian searches for information on it, a Swedish study comes up that discourages recommending it. One of the most frustrating things about laminitis therapy is the anecdotal nature of treatments, including, of course, Dr. Giacopuzzi's work with Viagra, which is the subject of this post as food for thought. I hope Dr Kellon's studies of the Chinese herbal remedy will be published one day in a veterinary or nutrition journal and that people like her and Dr Giacopuzzi will keep trying to responsibly help horses with laminitis. It would be irresponsible of me to publish recommendations for medicating horses. This information is published as "food for thought" not as any type of veterinary instruction. Your veterinarian can best advise you about any benefits that vasodilation therapy might have for your horse. Remember that Dr Giacopuzzi uses Viagra in combination with other medications, not as the only treatment for laminitis. He also sees quite severe cases of laminitis, which might require different dosages than horses with mild chronic laminitis. Please proceed with caution, for your horse's sake.